I did this tutorial on a whim. Yesterday when it was storming and I had to shuffle my plans and try to figure out things I could make/work on without electricity, I figured I could go ahead and shape these Hulk Smash cake pops (I already had the cake pop dough ready to go). It was pretty dark outside, so I moved my work mat and placed it on my washing machine, directly in front of a window. I realized as I started working that I probably had enough light to snap some pics, so I did! When Lauren asked me to do these, I was initially very scared. She had sent me a screen shot from Pinterest and I tracked back the original cake pop to Goods by K Creative (that was the watermark on the photo, although a search didn’t turn them up on her site). They were just so perfect… I was very intimidated. PS. While poking around on Goods by K Creative, I noticed she has a book out, Pop Art by Kris Galicia Brown. I don’t have the book (yet! ), but it looks like it would be a good addition to your library if you love to do cake pops! Anyway… when I stepped back and looked at the cake pops critically, I figured I could break them down into two basic shapes… a cube and a cylinder (plus the tiny thumb). So that’s how I made them… one shape at a time. Check out the photo tutorial below with instructions beneath it, and of course, I’d love for you to Pin it and share it! 1. Make cake pop dough (see my method here). 2. Roll out or pat out the dough to about 1″ thickness. 3. Using a square cookie cutter, cut out a cube (approximately 1″). 4. Using a pointy gum paste tool (sorry, I don’t know the technical name for that tool I used) or tiny cel stick, make a deep indention in the “front” of the cake pop – where the fingers would fold into the palm. 5. Using the same cell stick, make three lines for the fingers from the front all the way to the top/back. You want them deeper on the front and more shallow on the top. 6. Use a ball tool to make impressions on either side of the fist. 7. Roll out some more dough, this time slightly thinner – maybe half an inch to 3/4″ and cut out small circles that are approximately 3/4″ round. 8. Gently press those to the bottom of each fist. You could also use some melted chocolate to attach them, but mine stuck just fine without any chocolate (I had no electricity, so I couldn’t melt chocolate or I would’ve used it, but it turns out I didn’t need it after-all). 9. 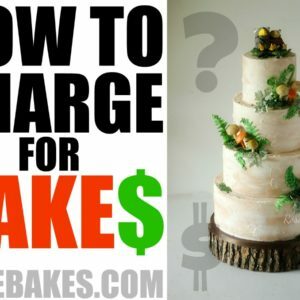 Roll out a thin rope of cake dough and cut tiny sections for the thumb. Again, I just pressed these onto the fists, but you could use a tiny drop of chocolate to attach them if you prefer. 10. Push them onto a lollipop stick, making sure you go deep enough to get both parts of the cake pop securely attached (dip the stick in chocolate first if you prefer). And that’s it! They were not nearly as hard as I thought they’d be (although they were time-consuming)!! Do you have any questions? Leave me a comment! Hi Rose. The Hulk cake pops are so cute. Thanks for the great tutorial. My nephew is going to love this one. Hi Rose, I love this tutorial, thank you! Do you think I can used it to make a fist for a cake?! With rice krispies maybe? I don’t see why you couldn’t use the same process to shape RKT into a fist, then dip it in chocolate. You may have to work a little harder to get it smooth, but it should work! Hi there – these are so cute! Can you tell me what you used for the spiderman ones also shown in the picture? Is it a cookie cutter? How would you decorate with 2 different colors? I don’t see a tutorial or mention of them on your website and I would love to try those also! I used a mold that I bought from Lollicakes by Ella. You can click that link to see her stuff! So glad you stopped by and left a comment Kris! I’m a BIG Craftsy fan so I’ll be sure to watch for your tutorials there too! 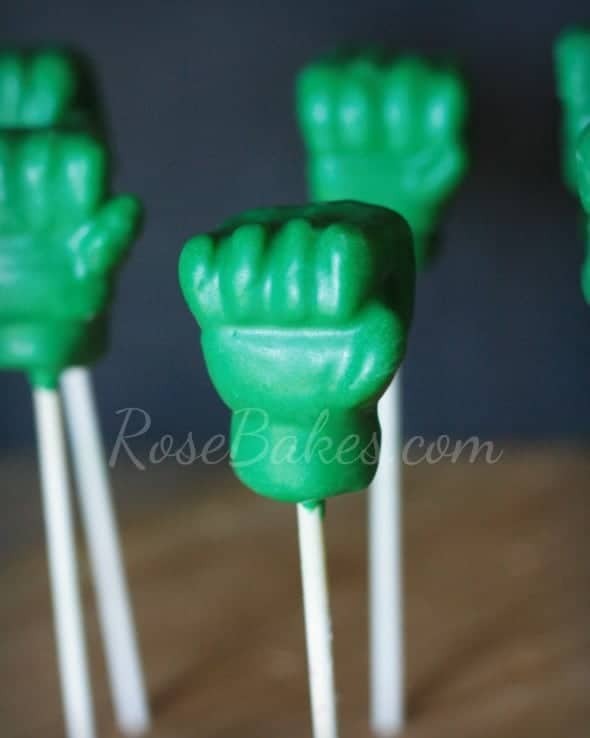 I’m not much of a baker, but I had to stop by and tell you how adorable the Hulk cake pops are. Perfect for a Hulk/Super hero party.